Goldilocks and … Two Firsts for Me! For the very first time, I taught in Froggy’s 1st & 2nd grade class! And for the very first time, I used a method of language teaching called Story Listening (SL). You can read all about the method at the Stories First website. It was a total success! I’m so thrilled! I had the children for a whole hour! As I entered the group, I said, “Guten Morgen,” and repeated it. To my delight, the children chimed right in! Then we went right into “Ich heiße…” Again, they were ready to repeat! We practiced the “ch” sound. Then we started again. The only thing was, they repeated my whole sentence, including my name 🙂 So we straightened that out, and I went around the room, asking each child’s name. I started with the 4 children who had been in my German class in Pre-K/Kindergarten. I figured they would be more comfortable with saying the phrase, and they could also be a good model for the other children. Next, I talked to the children about magic. Yup. Magic. To me, speaking a foreign language is a lot like making magic! It’s like cracking a code. Or knowing a secret – the good kind of secret 🙂 And just look! All of the children had already worked some magic! I never told them what Guten Morgen or Ich heiße meant. But of course, they knew. Then I told them I was going to teach them some more magic a little later…. Then I taught them the hello song. I used my word posters to teach them the actions: klatschen, stampfen, patschen. And we counted to 2. We talked about doing the actions quietly, so the classroom below us didn’t think there’s a herd of elephants – or a thunderstorm – upstairs! And then I asked them if I was showing them the right word, so they could practice ja and nein. Finally, it was time to sing the song! Next it was time for the children to be magicians! Because I was going to tell them a story. A whole story, all in German! I asked them to listen with their ears and watch with their eyes, and just relax and take it all in. Of course, by the time I had finished, the kids were a little restless. Time for some movement! So we played a game of Simon sagt! We used the verbs from the hello song (klatschen, stampfen, patschen) plus the verbs from our story: essen, spazieren gehen, rennen, einschlafen, aufwachen. It was a big hit! Then I had handouts for the children to do. I had come up with 5 ideas, and the teachers liked them all, so we made up packets for them to do. The first and second-graders got different ones, based on difficulty. The Stories First website also has a collection of stories for various languages and levels in the Great Story Reading Project. You do have to register to gain access. For our shape unit, we’ll be using some materials I bought a few years ago on TeachersPayTeachers.com. It was created by Open Wide the World, who has a number of German-language units. In fact, the weather unit I used last month was also created by them. I’m excited to start using all these colorful materials! Froggy is still into weather, so we’re continuing with the topic. I have to admit, I haven’t gotten to work on my own materials much lately. So I’m still relying on some great resources I’ve found online. I do have a couple of ideas up my sleeve, though! 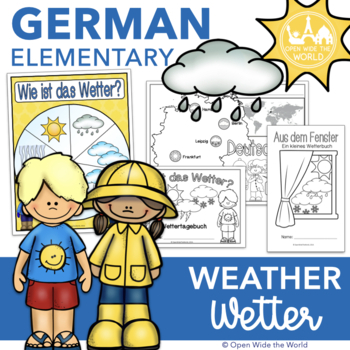 I found some fun books related to Weather and want to create some worksheets to go with them. We also had an idea for a super fun project! We’re going to do a weather comparison for some familiar places. Well, sort of familiar. We’ll be comparing our own weather in Philadelphia with Germany, Austria, and Switzerland (where our 3 au pairs are from!) along with the Netherlands (where PER is from, and where Oma & Opa still live). More on that soon…. Today we read a simple book: Elmar mag jedes Wetter by David McKee (translated from English; Thienemann, 2016). I made up a worksheet to go with it. See my post for the details and download! Time to start a weather project! We are going to record the weather in our town (Philadelphia), Germany, Austria, Switzerland, and the Netherlands. I’m working on a document for our recordings. I’ll post it as soon as it’s been tested and ready to go! The plan is to record the weather for a month and then graph our findings. We’ll see how it goes! I’d be happy with a week, I suppose! We’ve taken a break from our reading lessons in German with Froggy, but now that the holidays are behind us, we’re ready to dive back in. I decided to start by asking him if there was a topic he was interested in learning more about. “Space!” he replied, of course. Well, we’ve done an awful lot with that already. So I suggested weather, since he seems to have a strong interest in that topic. His teachers at school talk about the weather and the forecast every day at school. So he readily agreed. I looked through my files to see what I have on the subject, and happily found a rather nice unit already prepared! It was created by Open Wide the World, and you can get it on the Teachers Pay Teachers site for $6. Click here for a link to the unit. For our first lesson, I’m going to start by introducing the weather sentence using the poster display page (printed on letter-sized paper). Then we’ll do the matching worksheet. I was in the Pre-K/Kindergarten class today. I just love sharing the stories of St. Martin with the children. In a Montessori-based school where the principles of peace and respect are not only taught, but practiced on a daily basis, the kindness and generosity of the St. Martin story fit in beautifully. This year, I had a new tool for telling the story. I ordered a set of Bildkarten (picture cards) called St. Martin feiern mit Emma und Paul – Bildkarten für unser Erzähltheater. The cards are nice and big (DIN-A3: 11.7 x 16.5 inches), and the images are simple and clear. I didn’t use all of the cards, but chose a few to talk about Martin cutting his cloak in two to share with the beggar, the children crafting lanterns and then parading at night in the town square. There are also some images to show Paul dropping his Martinsmann cookie and Emma breaking her own cookie in two to share with Paul. Very sweet! The books I have for Martinstag have quite a bit of text. They work fine for story hour, where the children come from German-speaking families. However, I really liked the format of having large pictures to show while I explained the story, simply and in English. After teaching the words to “Laterne, Laterne,” the children made their paper lanterns – with some help from the two teachers and myself. We were glad to have some tape on hand, as a few of the children didn’t quite get the instruction not to cut all the way through! One of the teachers gave the useful tip that cutting the strips in the lanterns is very much like cutting fringe – a work they do regularly in the classroom. As the children finished their lanterns, they took a seat on the rug until everyone was finished. Then we sang the song as we paraded through the classroom and out into the hall. The principal and several other staff members came out to see where the singing was coming from. She said it sounded like little angels! If you missed the post on the lantern instructions or the vocabulary cards to help teach the song, click here to go back and take a look! How do you help the children celebrate Martinstag? I’d love to hear!